With the exhibition Sharing Processes / AFLUENTS as the starting point, and as part of the Miniespai, ACVic presented a workshop activity focused upon learning about one of the town’s most important heritage sites: Les Adoberies district. 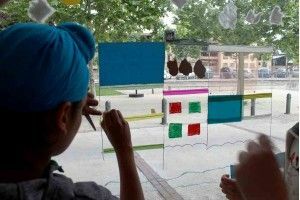 The workshop was adapted for two groups of 6th year primary school students from the Escola Vic Centre, having previously taken place with family groups. The activity consisted of walking through the district to learn about its history and architecture, a visit to the exhibition Sharing Processes / AFLUENTS, and finally, a practical activity which consisted of bringing life back to the space, taking advantage of the view of Les Adoberies from ACVic.